I've been spending a lot of time immersed in fairy stories and folk lore lately. Partly because I've been writing some rather dark ones (see January's Writers' Forum and the current Mslexia, apologies for the shamelss plug) and partly because I've been reading fellow History Girl Anna Mazzola's rather wonderful The Story Keeper (out in July, no apologies for the plug). 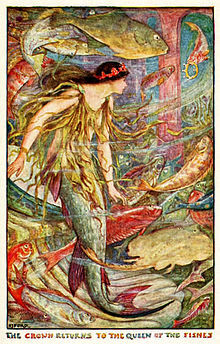 There is very little difference in general terms between fairy and folk tales. Although the former is likely to include a higher degree of magic or fantasy, there is a lot of crossover and both owe their origins to an oral tradition which is 'popular' in the sense that they derive not from an elite but from the masses, the Volk. Literary fashions come and go but the fascination with fairy tales is a constant. They act both as a nostalgic link to our, perhaps romanticised and certainly mythologised, past and also live very much in the present, providing a form of entertainment which can act as a common vehicle for shared fears, values and dilemmas. Pyschologist Bruno Brettelheim describes them as carrying important messages to the conscious, the preconscious, and the unconscious mind or, as GK Chesterton rather more whimsically puts it: Fairytales are more than true, not because they tell us that dragons exist, but because they tell us that dragons can be beaten. It is that message, with its important caveat can be not will be, which keeps them relevant. 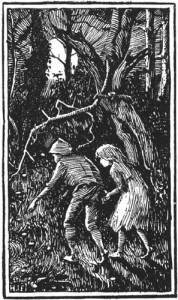 The use of fear and violence in fairy stories has always been contentious, perhaps because of a refusal to accept that sweet-little children like dark things. The Victorians didn't believe the red-in-tooth-and claw scenarios or malevolent fairies of earlier incarnations were suitable for children, and don't get me started on the horrors perpetrated by Disney's prettifying. Having always been of the opinion that a bit of fear is good for the rug-rats (and having spent a lot of my own childhood as an unsupervised reader) mine grew up with the un-sanitised versions which probably made them responsible for a lot of wide-eyes among their friends. Tales of Olden Times (1697) which included Little Red Riding Hood, Cinderella and Sleeping Beauty, and the Grimm Brothers’ Children’s and Household Tales (1812–57). This map then widens to include The Tales of the Thousand and One Nights in the east, Hans Christian Anderson in Denmark; Alexander Afanasyev in Russia; Walter Scott collecting the rich cultural heritage of Scotland and women such as Fannie Hardy Eckstorm in America who focused particularly on ballads. Perrault himself was quite clear on the moral element of his stories, particularly the warning about predatory men in Little Red Riding Hood: I say Wolf, for all wolves are not of the same sort; there is one kind with an amenable disposition – neither noisy, nor hateful, nor angry, but tame, obliging and gentle, following the young maids in the streets, even into their homes. Alas! Who does not know that these gentle wolves are of all such creatures the most dangerous! A sentiment echoed in Angela Carter's updated version of the story, Company of Wolves, to never trust a man whose eyebrows meet in the middle. The original Ms Red jumped into bed and was, of course, eaten. I must have dipped in and out of all the above collections at some point but my favourite set of books has never changed: Andrew Lang's Fairy Books of Many Colours. Lang (1844-1912) was a Scottish poet, novelist, literary critic and collector of fairy tales whose first book on the subject, The Blue Fairy Book, was published in 1889. The full set comprises 25 books published between 1889-1913, of which the 12 beautifully illustrated coloured books (named for their covers) are probably the most well known. The stories come not just from Scotland and Europe (which were already familiar to me) but from all over the world, including America, Persia, Australia and China, adding a further layer of magic for a child growing up in the isolation that was 1960s and 1970s Cumbria. I lived in those books for years. 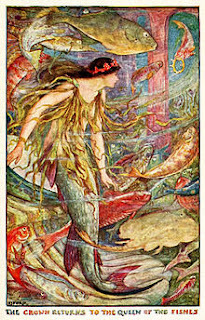 The stories were unfiltered and unprettied - in publishing them Lang was fighting the traditionalists of the day who, in the words of writer and academic Roger Lancelyn Green, judged the tales' unreality, brutality, and escapism to be harmful for young readers, while holding that such stories were beneath the serious consideration of those of mature age. The popularity of the collections, however, completely changed this perception and spawned a raft of imitators. Was I frightened by the parade of monsters and murderers? Yes, and so were my children and it did us no harm. Fairy stories gave the monsters that live in childhood fears a name and make us realise that everyone fears the same things - the nameless predator, the lurking disaster. As Mary Wakefield of The Spectator put it a few years ago and the original Little Red Riding Hood rather harshly learned: in folk tales, but only rarely in modern children’s tales, there’s a strong feeling that the hero or heroine really could screw up; that they must stay on their mettle to survive. Good intentions are no excuse in fairyland...if you ignore sound advice...you end up as wolf bait...In Disney-land, a heroine need not be on her guard, because the good guy always wins. And we all know how that turned out. Fairy stories provide some valuable real-life lessons with a bit of entertainment to sweeten the message and they do it so well because they tap into our deepest darkest dreads. It's no surprise that many of the countries trying to re-introduce wolves face objections from local communities which the worthies describe as irrational - or why we're all terrified of the robot dogs currently featured everywhere, it's in our folklore DNA. 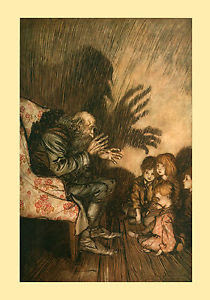 Fairy stories are still the first shared experience most of us have of story-telling. We will continue to read and pass them on, they will continue to evolve. We live these days in strange, dark times when we need to remember our commonalities not our differences. Perhaps the stories we should tell on these never-ending winter nights need less pitchforks pointed at those we shouldn't be afraid of and a lot more banding together to beat the big bad wolf still hiding in plain sight. Brilliant piece. And big thanks for the plug! Excellent insight Cat! Thanks for sharing this.